I placed an order for a couple of Kiss My Keto Chocolate Bars. I went with the Original flavor and Hazelnut bar. These (almost guilt-free) ketogenic chocolate bars are sugar-free and sweetened with stevia. Why do I say almost? Though they are sugar-free they still do have some calories that you need to be aware of! If you eat the entire bar of the original flavor that comes out to 380 calories… so don’t eat the entire bar in one day! What I like to do is enjoy the chocolate bars in thirds, which is the suggested serving size. One serving is 130 calories. You can see the macro breakdown below. These delicious Kiss My Keto chocolate bars are specifically designed for anyone doing a keto diet AND you still want to enjoy your chocolate. The macros will allow you to remain in ketosis. One serving is only going to be 2 net carbs, which is fantastic considering that this is for your sweet tooth! The chocolate bars are also infused with MCT which is going to help you along on your weight-loss journey. Burn fat with fat! This Kiss My Keto Toasted Hazelnut Dark Chocolate Bar has the right combination and nuttiness happening here. A nice plus to this hazelnut bar is that the hazelnuts are going to give you a boost in fat. One serving size contains 13g of fat, 130 calories, and 2g net carbs. There are two other flavors of Kiss My Keto Chocolate Bars that I have yet to give a whirl too! Kiss My Keto also has a Chocolate Pumpkin Seeds & Sea Salt bar and a Dark Chocolate Roasted Almonds bar. This flavor of Kiss My Keto Chocolate contains pumpkin seeds and sea salt along with dark chocolate. Did you know that pumpkin seeds are a fantastic source of zinc for your diet? This nutrient is perfect for skin care and your immune system. Lots of great stuff happening here with this Kiss My Keto dark chocolate almond bar. Almonds are a great source of Vitamin E, protein, fiber, magnesium, folate, potassium, among others! This particular bar is a powerhouse of healthy vitamins and nutrients. Who knew chocolate could be so beneficial for your healthy diet? It really just depends on the chocolate bar that you pick up! You can’t get ahold of Hershey Bar and think that there are health benefits to that… right? I think with chocolate you get what you pay for. When you do the math with these, if you make a one-time purchase, each bar comes out to be $6.25 in the four-pack. If you only nibble on one serving per day, your cost is around $2 for each serving. Not too shabby when you look at it that way. Kiss My Keto’s chocolate is chocolate that you can feel good about putting in your body. I need my regular fix of chocolate and Kiss My Keto Chocolate will be one of my new go-to brands that I reach for when I have that chocolate candy craving. Kiss My Keto Chocolate Bars & a way to save! You can order a 4-pack of chocolate bars for $24.99 or you can sign up for a subscription and get a 4-pack of bars for $21.24. That is a 15% savings. And you are going to want to subscribe because these chocolate bars are the bomb and you are going to want more. Trust me on this! Kiss My Keto also has this wonderful thing called The Keto Club. With the Kiss My Keto Keto Club, you earn points on every order and those points can be redeemed and you can earn free product. Here is how it works… for every dollar spent you can earn 1 point. For every 100 points that you earn you get a $1 credit for your next order. Kiss My Keto Energy – one other product that I had to try! I also threw in a Kiss My Keto Energy supplement into my order. For a while, I had a bit of a problem with energy drinks. I know they are terrible for you but I am a big fan of Bang Energy. I am looking to cut back and eliminate energy drinks from my diet. When I came across the energy supplement I was intrigued. Wondering what is inside these gel caps? This energy supplement has MCT oil in it. The MCT is going to kickstart your ketosis and burn fat. The MCT oil is a must-have for anyone doing a low-carb diet and wants to shed some pounds. The l-theanine that is used in this supplement is known to improve cognition, attention, and focus. After taking this supplement I did feel the increased focus and I was able to get some things done around the house. I took the supplement in the late afternoon, which is when I start to feel drained because I was up at some insanely early hours. This supplement enabled me to push through and fight fatigue. The Kiss My Keto energy supplement contains a blend of caffeine, MCT, and a big dose of l-theanine. Each supplement bottle contains enough for a month supply. I gave them a whirl and I did notice a big boost in energy and focus. For me, there were no side effects. This supplement sells for $29.99 so that comes out to being only a buck a day for good, clean energy without the jitters! If you subscribe you can save 15% and get a bottle for $25.49. Kiss My Keto might just be your next go-to brand for your ketogenic lifestyle and diet. There are many other products offered at Kiss My Keto that will help you burn that fat that you so desperately want to lose. Watch the video below to learn more. Want to save at Kiss My Keto? It is your lucky day!! Woohoo! 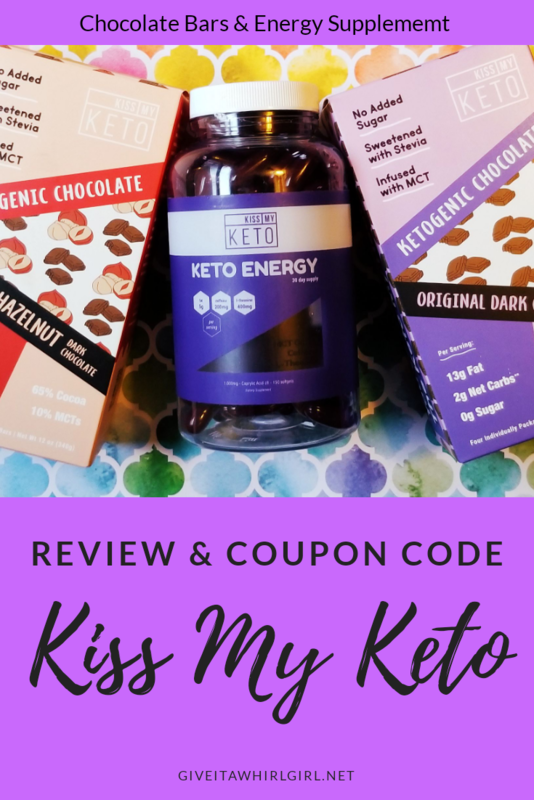 I have a Kiss My Keto coupon code to share with my readers! Question time! Take a look around Kiss My Keto and come back here and tell me what you want to try. Primal Kitchen Collagen Bars & Fuel Powder â Great For Healthy Hair, Skin, and Nails & A Primal Kitchen Coupon Code! This entry was posted in Health and Wellness, Product Reviews and tagged caffeine, candy, coupon, dark chocolate, energy, gluten free, healthy food, keto, keto bar, ketogenic, Kiss My Keto, l-theanine, lactose free, MCT Oil, soy-free, sugar free, supplement, vegetarian. Bookmark the permalink.